The option .Car2x is particularly suitable for application and function development of ECUs that receive their information on the basis of V2X application messages. 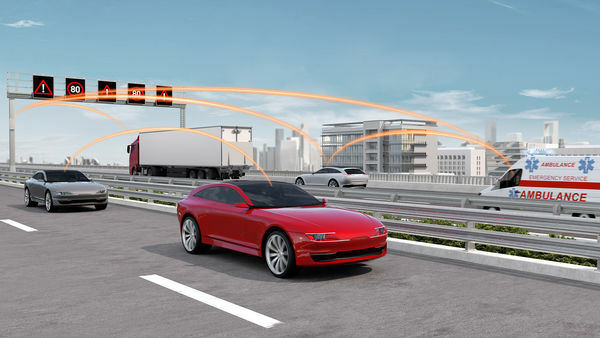 CANoe .Car2x offers a range of functions designed to configure and run traffic scenarios so that the functions of the ECU can be tested comprehensively. This allows you to stimulate your Car2x control unit according to the situation and test the implemented functions in a targeted manner. CANoe .Car2x is designed to optimally fulfill your requirements. You receive a sophisticated tool that is completely adapted to the requirements of the Car2x domain. Therefore CANoe .Car2x supports the most common standards and protocols published by IEEE (US) and ETSI (EU) worldwide. This includes application messages such as CAM, DENM, SPaT, MAP, IVI and BSM, as well as the underlying protocols such as GeoNetworking for the EU or IEEE 1609 (WAVE) for the US. In addition, all the powerful functions that you already know from CANoe are available. This makes CANoe with the option .Car2x the ideal extension of your multibus test tool for getting your V2X-based ECUs on the road to series production. Analyze — Analyze your ECU with the help of individually adaptable measurement windows. Stimulate — Create a virtual environment for your ECU. Test — Put your ECUs to the test. Visualize — Always keep an eye on your scenario. Secure — Test your ECU with activated security. Combine — Combine the option .Car2x with other bus options. Analyze Car2x-specific communication protocols, access application messages (CAM, DENM, BSM...) described in a database and implement individual analysis functions. Set up your test environment quickly and easily using domain-specific programming libraries and use the interaction layer to configure the communication behavior in the database. With CANoe .Car2x you can comfortably create test modules based on your environment simulation, which can run automatically and reproducibly with different parameter sets. The result is summarized in a test report. Comfortably create test modules which can run automatically and reproducibly with different parameter sets and summarize results in the test report. Activate security mechanisms and stimulate with valid signed and therefore from the ECU accepted frames. Check received frames for the used PKI and valid signature. Access data from different networks. Add with option .Car2x the toolchain seamlessly and test gateway functionalities. With CANoe .Car2x you can use/send any application messages such as CAM/DENM (ETSI) or BSM/TIM (SAE) that are defined in ASN.1. The Car2x Network Explorer is a viewer for Car2x databases and provides various functions. On the one hand, it provides a clear representation of the data structure of the messages and makes it possible to quickly find the signals you are looking for. On the other hand, you can configure the send behavior using the node and message attributes. By generating CAPL structure files, you can also quickly and easily access the signals/data fields in CAPL. CANoe.Car2x requires a description of the application message to be able to create or decode messages. These messages are made available to CANoe by the Car2x databases and contain all necessary information for encoding/decoding and for converting the physical raw values into the logical values. The database also contains information about the assignment of application messages to network nodes. A database is added to the WLAN network in the simulation setup. The map window gives you a quick overview of your test scenario. The positions of all received Car2x objects (ITS Vehicle Stations, ITS Roadside Stations) are automatically visualized on the map. In addition, you can draw objects into the map window using a programming library. This allows you to individually adapt your test configuration to your needs, e.g. to display test-specific parameters or status information in the map window. The synchronization with other windows simplifies the subsequent analysis. With the Protocol Analyzer you execute Car2x protocol checks automatically. You can check protocol-specific contents individually for the particular protocols such as GeoNetworking, IEEE1609.3 and security (ETSI/IEEE1609.2). If an error is detected, warning and error messages are displayed in the trace window and in the detail view. The trace window provides extended functionality for evaluating 802.11p WLAN packets, protocols (WAVE 1609.x, ETSI) and application messages (SAE, ETSI). In addition to the general functions in CANoe, you can customize the window for specific domains. Application messages are therefore decoded according to their definition in the database. It also allows you to configure columns, highlight packages/logs/ or analyze error messages from the Protocol Analyzer. Select test-dependent signals from vehicles you want to monitor. The data window displays the resolved values including the units defined in the database. If you would like to display these signals graphically, the graphics window can be used alternatively. To analyze states and state transitions, and to visualize time dependencies, we recommend the State Tracker. The Car2x Station Manager is the central unit for the management of ITS stations. Using the Car2x Station Manager, you can manually or automatically assign received packets to the ITS stations managed in CANoe. With this CANoe.Car2x offers not only a packet-based but also an ITS station-based view on the communication. For a good overview, you can specify individual colors for ITS stations. The Car2x Scenario Editor is an application with which traffic scenarios can be created via a graphical interface. For this they need routes and stations. A route is a path defined by waypoints on which stations (e.g. vehicles, RSUs) can be located. The waypoints can be created by the user in the Edit mode (Ribbon|Group Routes|Edit) by clicking with the mouse on the map. A station is a road user such as a vehicle or a traffic light. These are assigned to a route. The Car2x Interaction Layer is configured via the Car2x database and supports you in creating your environment simulation. You can create nodes (ITS stations) and specify which application messages are sent from these nodes. A supporting CAPL function library also offers functions for setting and reading the data contents and protocol information as well as for changing the transmission behavior at runtime. So you can update their contents before sending the message, suppress sending or simply adjust the cycle time to your test needs. The Car2x function library (programming interface) available in CAPL provides domain-specific functions for accessing and reacting to the data contents of the packages. This allows extended analysis functions and tests to be implemented. This library also makes it possible to create an environment simulation that is necessary as a condition for the stimulation of ECUs so that they can be tested specifically. In order to accept the WLAN messages generated by CANoe.Car2x from the to be tested ECU, the packet must contain a valid signed security header. The certificate manager offers the possibility to create a PKI (ETSI and IEEE1609) and export the generated certificates. If a PKI already exists, certificates (including the private keys) can be imported into CANoe.Car2x. With the Car2x Certificate Explorer you can record and analyze known certificates stored and received in the Car2x Certificate Manager. It also shows you the trustworthiness, the certificate or signature hierarchy and the content of the certificates. The number of valid, invalid and not yet evaluable certificates is displayed in a status bar in the lower area of the Car2x Certificate Explorer. The Car2x function library available in CAPL offers special functions for example to create a valid signed security header. You can also use these functions to change the certificate of your test node at runtime to test the behavior of the ECU with an invalid certificate, for example. The VN4610 is a powerful interface with USB PC connection for accessing IEEE 802.11p and CAN (FD) networks. The IEEE 802.11p based dedicated short range communication (DSRC) communicates in the 5.9 GHz range. The VN4610 supports the unfiltered receiving and sending of IEEE 802.11p frames used for the implementation of Car2x/V2x applications. The received IEEE 802.11p radio signal based frames are transferred to the application synchronously to the CAN (FD) messages. The built-in GNSS receiver supplies the GNSS time and the current GNSS position. CANoe .Car2x provides a variety of possibilities for simulating, developing and testing of 802.11p-based communication applications. But only those who are familiar with these options can fully tap the potential and save time and money. Benefit from our workshops in order to use CANoe .Car2x even more efficiently in your daily work.